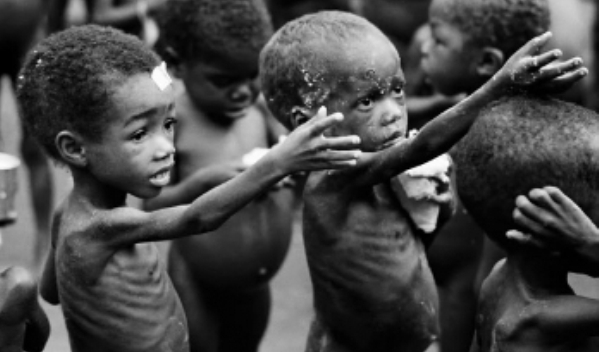 Many years ago I was approached by a compassionate ministry organization with the request that I create a new sculpture that could represent their work. My goal was to sculpt a piece that could could tell their story but also represent the story of compassion that is present in every group who is stepping into that hard place. The motivation for a design can come from many different places. the money was dispersed, and the song felt old. in our mind have long been traded for new ones. constantly rehearses his dark drama. In 1982, Hermine and I lived in Prairie Village, on the Kansas side of the Kansas City metro area. 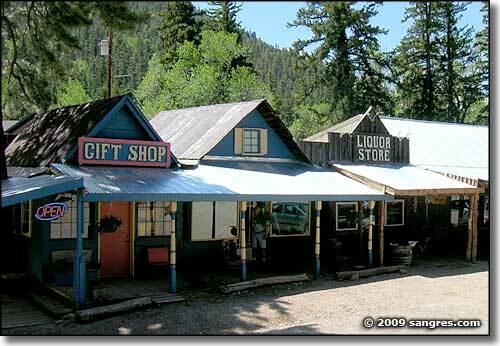 On our summer vacation to Colorado, one afternoon we drove south from Westcliffe to La Veta Pass. My dad entertained us with stories about when his family came over the same pass to do migrant work in the San Luis Valley during the depression in the 1930s.I always felt connected to the Rocky Mountains and his stories welded that connection even stronger. Our destination was a little town called Cuchara. 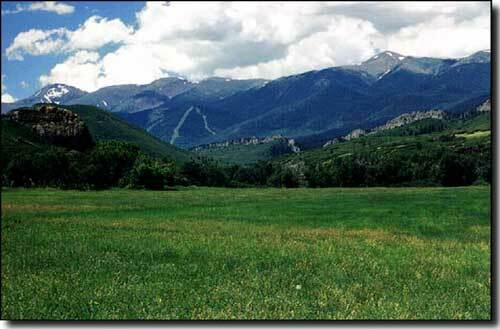 Colorado.com describes it as “classic Colorado — where snow capped mountains meet lush green fields and rushing rivers. Tucked in the eastern shadow of the Sangre de Cristo Mountains, this serene town rests between the rich forests of the San Isabel National Forest and the Cucharas River, which cuts right through town.” Coming from Kansas and the summer heat, it was exactly what we were hoping for. Mom and Dad and Hermine and I wandered through the shops and into a gallery that was filled with beautiful western art; sculpture and paintings. Up a short flight of stairs and I stepped into the studio of the artist and sculptor, Gene Stewart. I spent the whole of the next winter season, in my basement, creating my first sculpture. 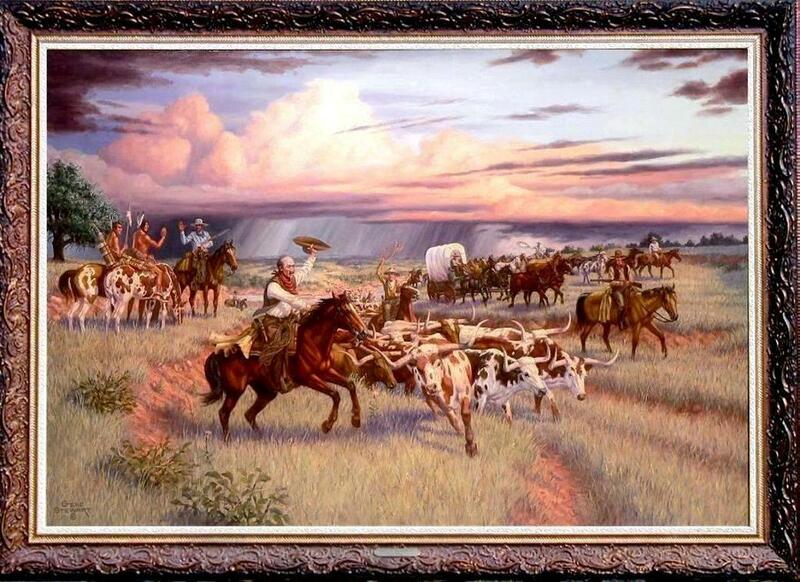 Gene is a western artist. He’s won awards and been published many times. So, of course my first piece would be western too; a cowboy. Before I found my own voice as a sculptor, I borrowed Gene’s. 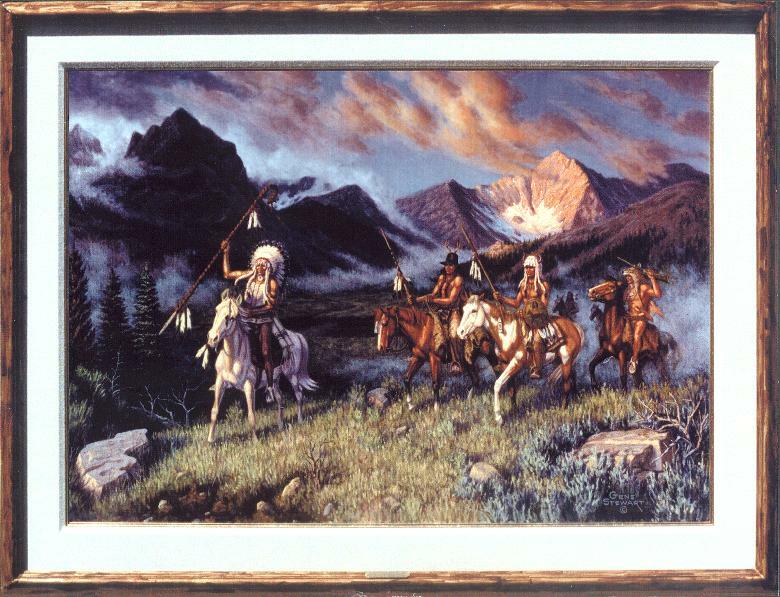 Today, there is never a moment when I receive a curious question about my work that I don’t think about that summer day in Colorado and the gracious guidance I received. 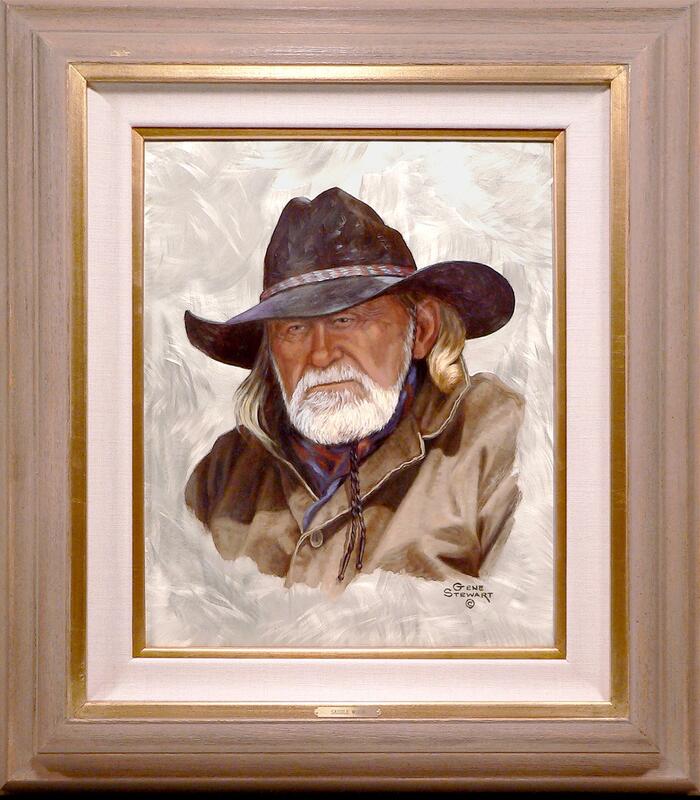 Gene Stewart; an artist from Oklahoma who changed the course of my life. When my friend Scott starts to tell a story, a chatty room gets quiet. His stories are witty, drawn out patiently, and worth hearing. He’s like big ole’ Grizzly Adams, Will Rogers, and your favorite cousin, all wrapped together. 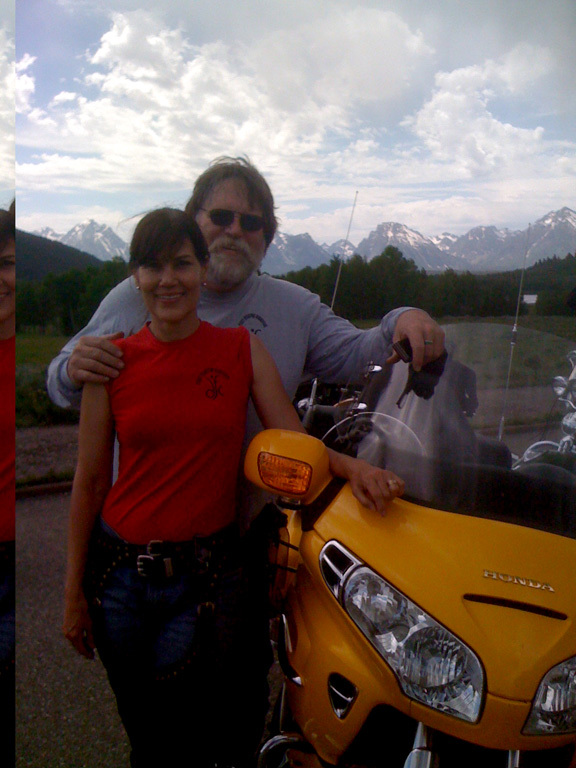 A few years ago, one of my sons described Scott as a “Santa in Summer.” If that’s true, then Santa lives in a big-timber log house in the mountains and does road trips on a huge yellow motorcycle with his wife Hermine. People listen to Scott. And, Scott leans in to listen to people. That is probably why he’s so outstanding at what he does. 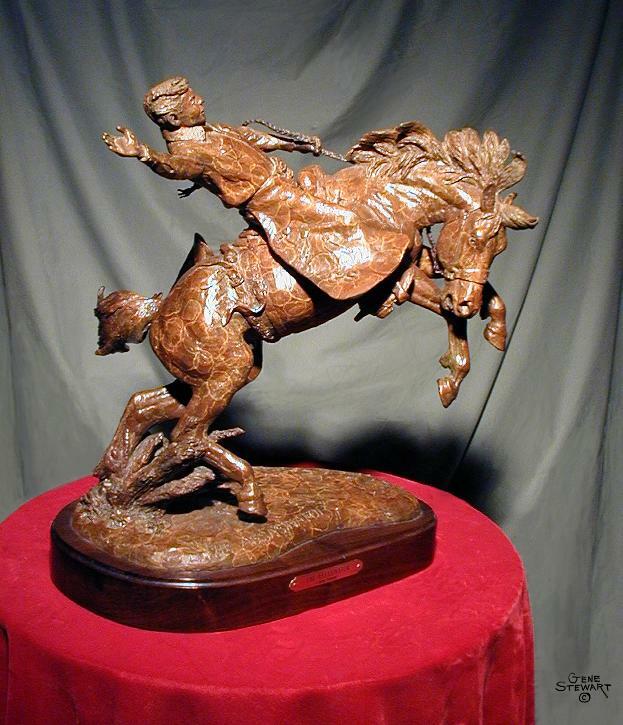 Scott Stearman is a sculptor. He tells his stories in bronze. Bronze sculptures are timeless containers for our collective stories. What sculptures capture in the present, they continue to speak long into the ages. Bronzes outlive the generations that birth them. They preside over public places and whisper their history into the present. Like no other art form, they withstand the weather of time, and tirelessly ask the future to pause and remember. 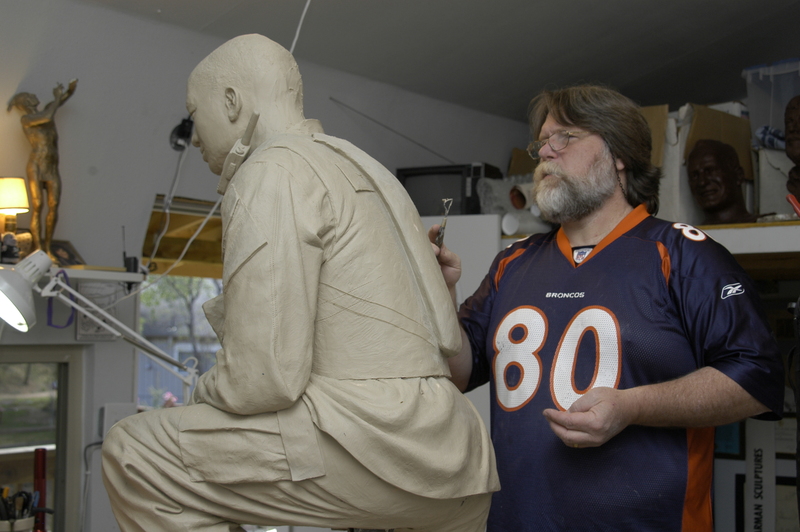 Scott’s studio and partner foundry are here in Colorado, but his work permanently stands and whispers in places like universities, city squares, military memorials, hospitals, financial institutions — all over the country. 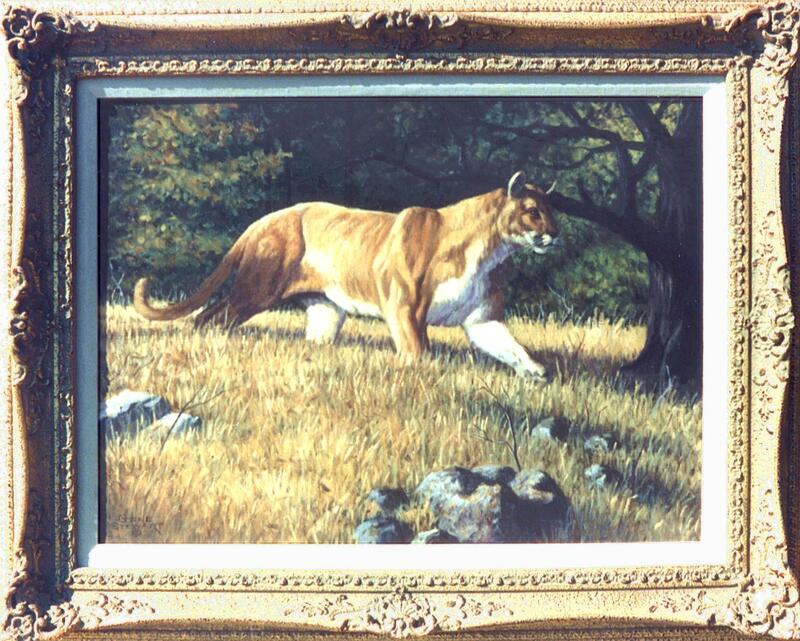 One of my favorite things about Scott’s work is the layers of detailed symbolism he includes. It’s like playing “I Spy” to find the embedded messages. 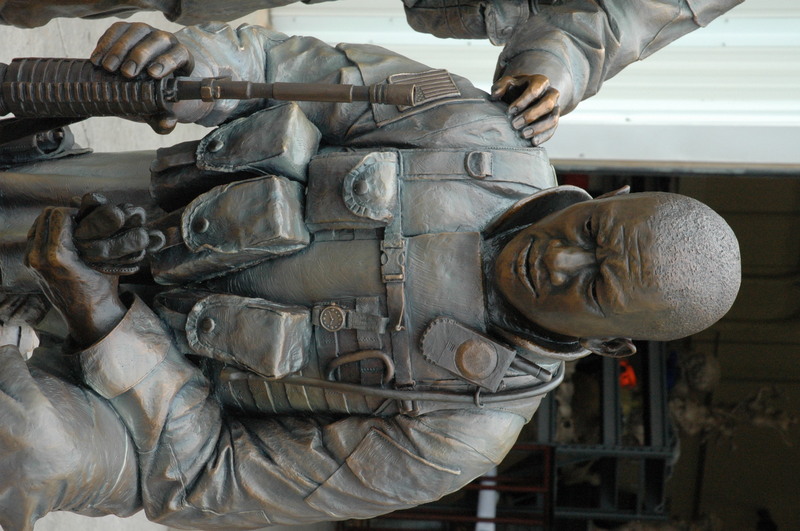 For instance, one of his military sculpture includes details only a soldier will notice. A wristwatch set to 9:11 as a nod to the New York terrorist attacks. 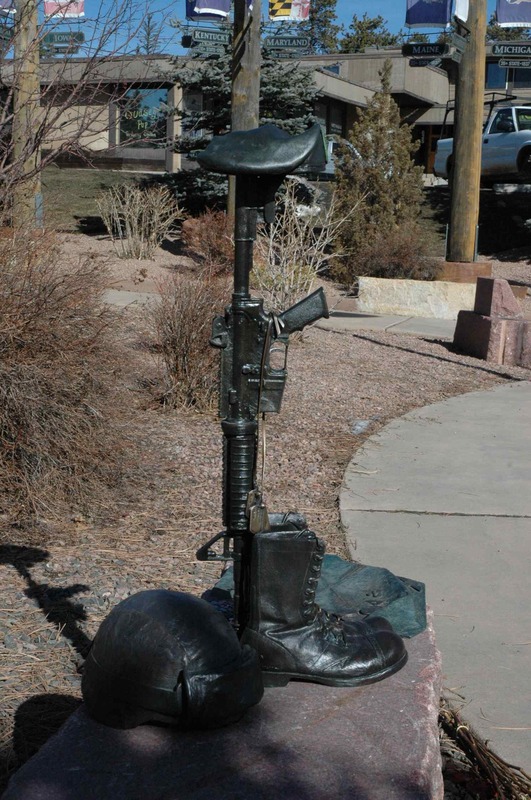 A picture of a soldier’s fiance’ tucked in a helmet. 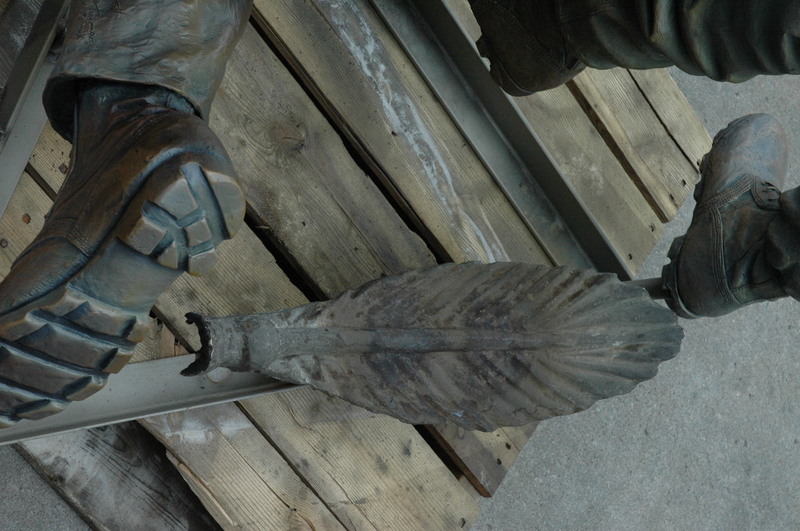 A metal feather taken from Saddam Hussein’s palace — placed on the ground under a boot, in symbol of defeat. A right shoulder empty of gear, and one knee-pad on a right-knee, for a rifleman’s clear shot. A wedding ring quietly speaking it’s promise to someone back home. 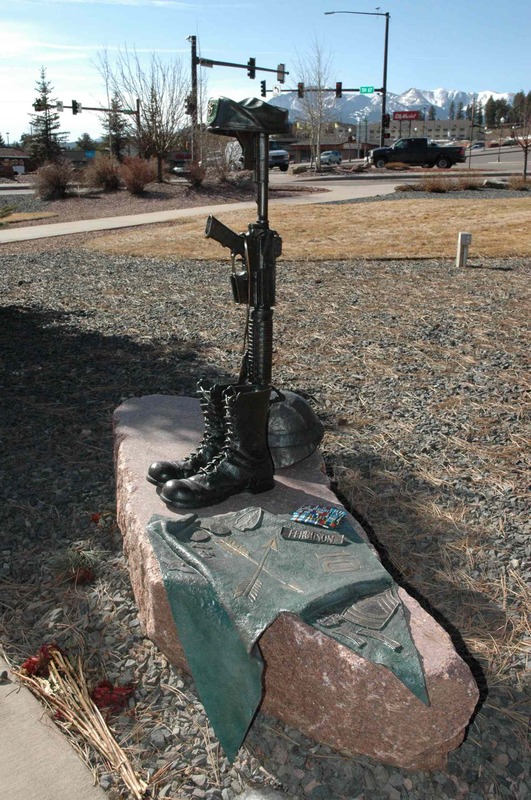 And his memorial sculpture at US Central Command in FL, places a very real replica of Scott’s Fort Carson model, Sgt. Amy Perkins strategically. She is now standing permanently, looking directly at the name of the fiance’ she lost, killed in Afghanistan. In my home town of Woodland Park, we have a lot of soldiers. The Army’s Ft. Carson is 40 minutes down the pass and we hear often about another soldier from the base who’s not coming home from war. “Fergy” was a Master Sergeant with the 10th Special Forces Group, a Green Beret. A friend introduced me to his wife and we began to talk about creating a place where Fergy would be remembered. 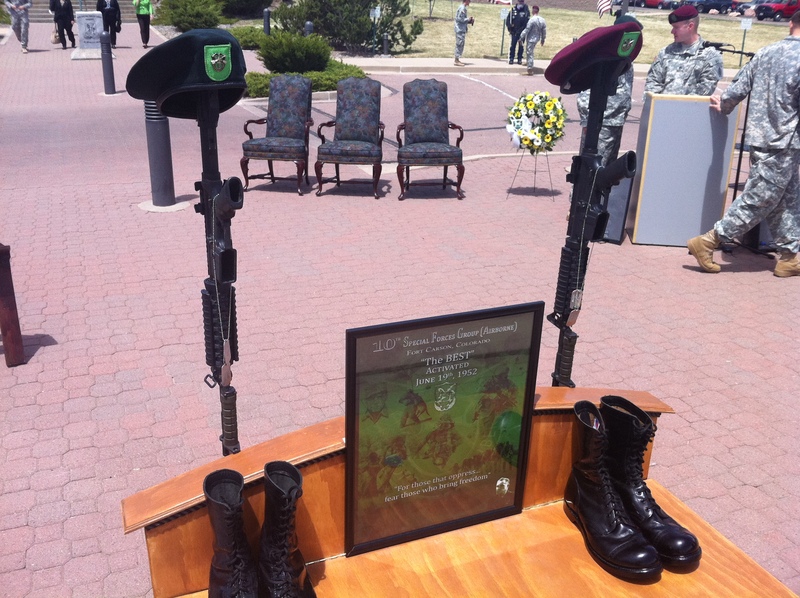 I was invited to attend a ceremony at the 10th Group where they honored the fallen. Names were read and families recognized. 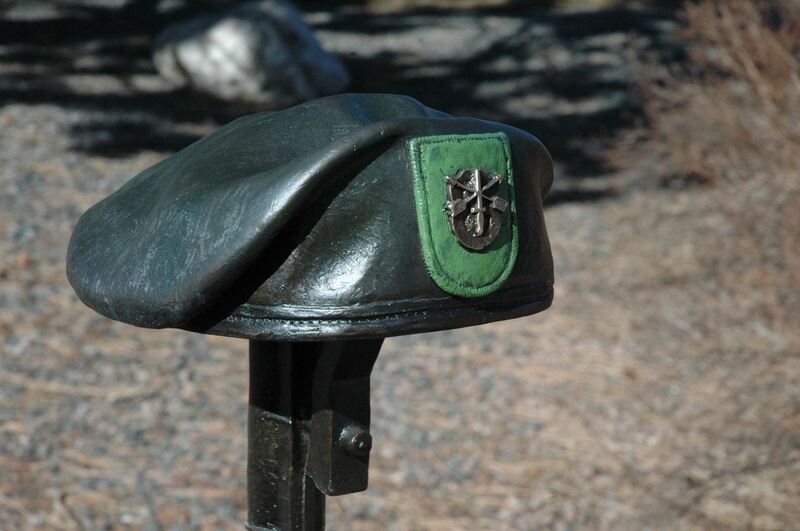 At the center of the ceremony they had erected a battle cross; boots, rifle, beret, and dog tags standing straight and silent in their tribute. We talked about this image and she told me this was how she wanted to honor her husband. 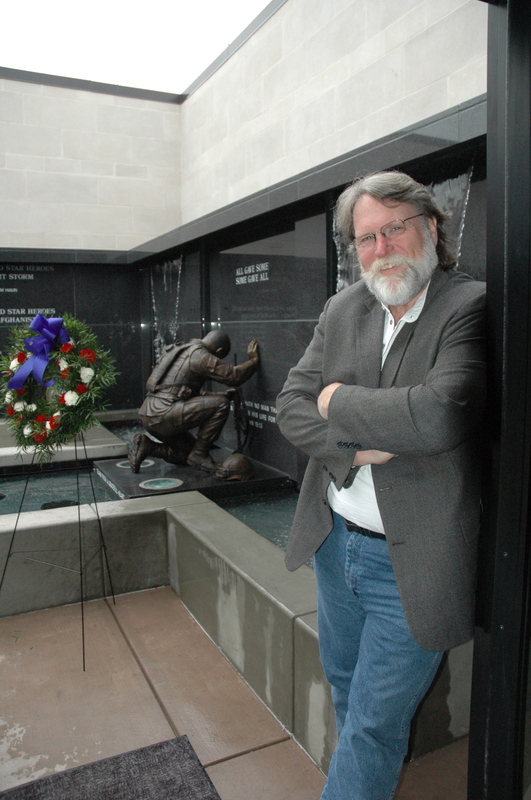 Creating a military memorial is a huge honor and a huge responsibility. 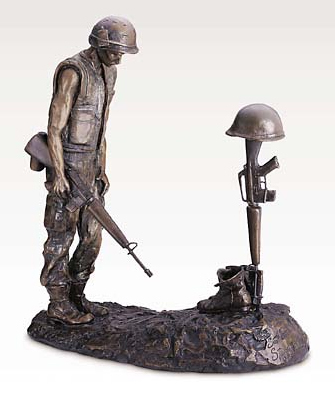 I learned 20 years earlier, with my first military sculpture, that the work and detail must be correct. 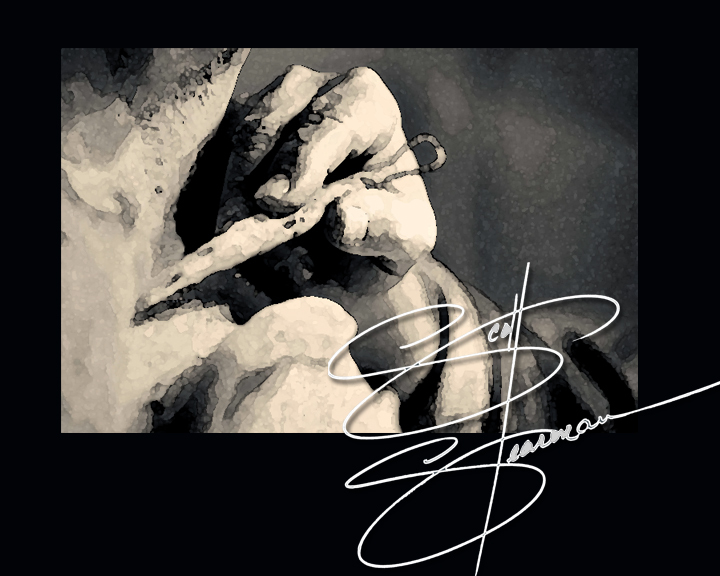 But, more important than just creating an accurate sculpture, I have to tell the story well. I have to take cold, impersonal bronze and mold something that connects with the heart; deeper than mere accuracy in the detail. So, I sculpted the battle cross as correctly as I could and placed it In the park, in the middle of town on top of a large piece of Pikes Peak granite. But, his story is presented in the personal. He was serving in the desert when he died, so I created a helmet with desert goggles. I made molds and cast replicas of his dog tags.The 10th Special Forces Group guidon is sculpted so it drapes over the granite base. Military coins were added as if they’d been left there by friends. 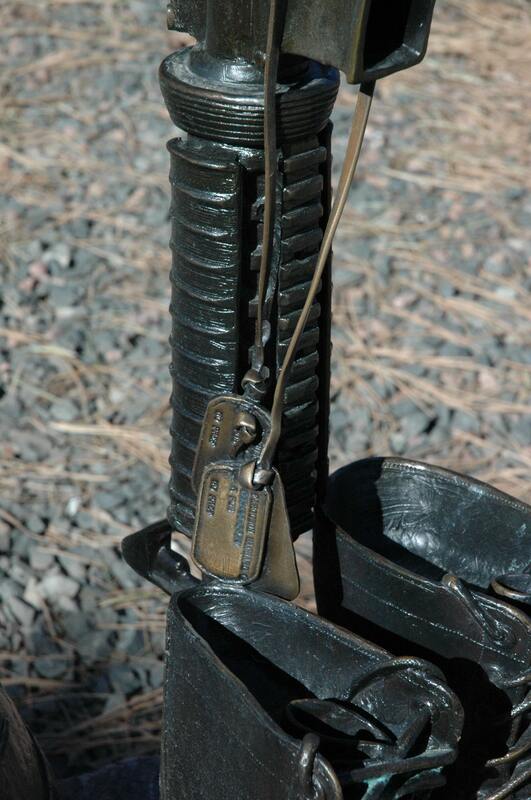 Fergy’s Master Sergeant stripes, his name patch and his service ribbons were modeled onto the banner. The sobering truth is that this monument to Fergy will outlive us all. I have to tell his story well to assure that the future will know him. His grandchildren will someday stand here. If my effort was successful, they will see, and feel, and know his story. I received a couple of emails this morning from two Gold Star Mothers. They both watched their sons leave for the war in the desert; both bold and ready and strong. And then … an awful day … he’s not coming home. 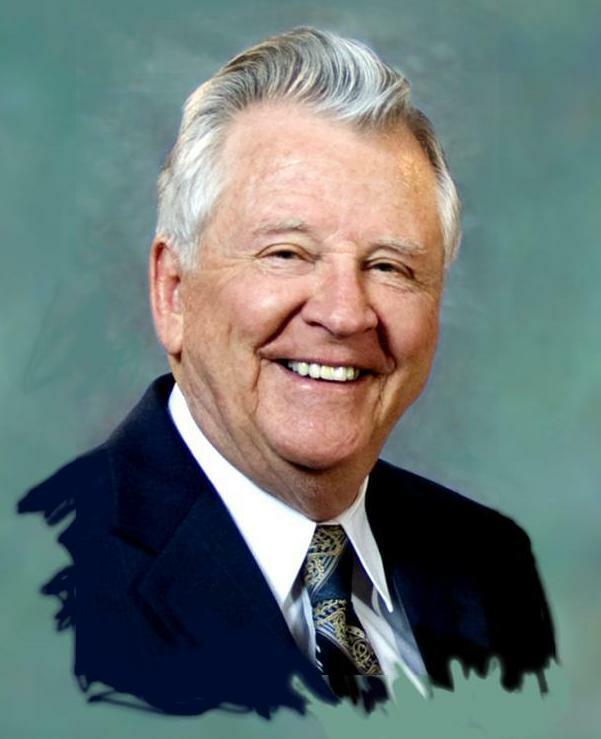 His presence now is in proud pictures, precious memories, and a folded flag. 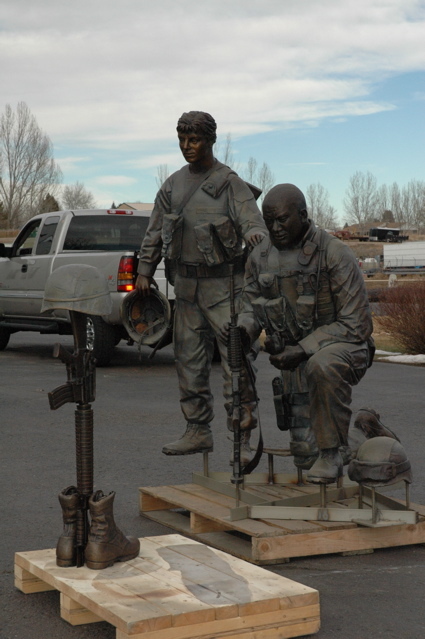 They asked about a sculpture to help honor their sons. How am I qualified to step into that place… with them? I’m not. But I will do my best. 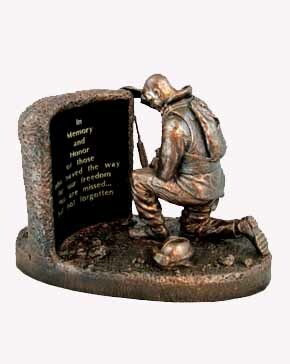 But how do you sculpt honor and dignity and sacrifice? I’m trying to learn. I know that when a mom holds one of my sculptures in her hands and it is supposed to tell her story and her son’s story, I feel the weight of that moment. 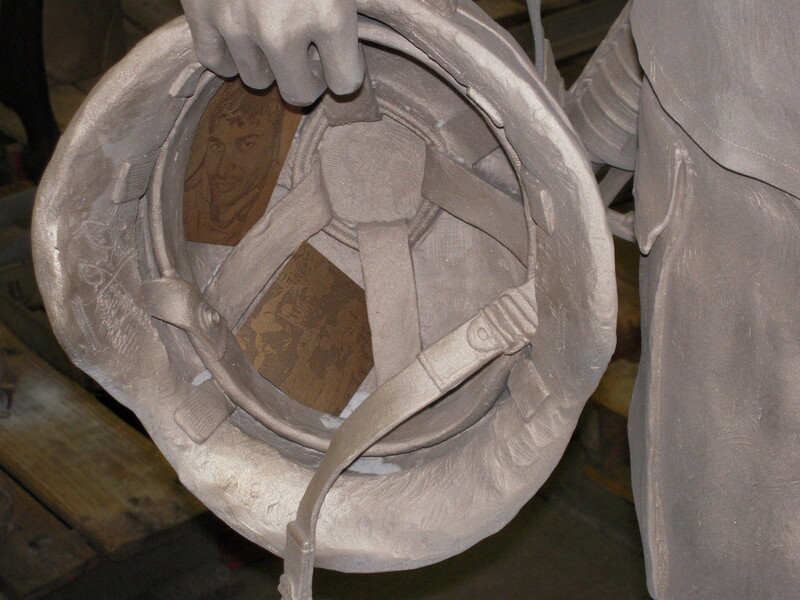 So, when I’m alone in my studio, shaping the clay in front of me, all those families and fallen soldiers are looking over my shoulder … whispering … so I get the story right. 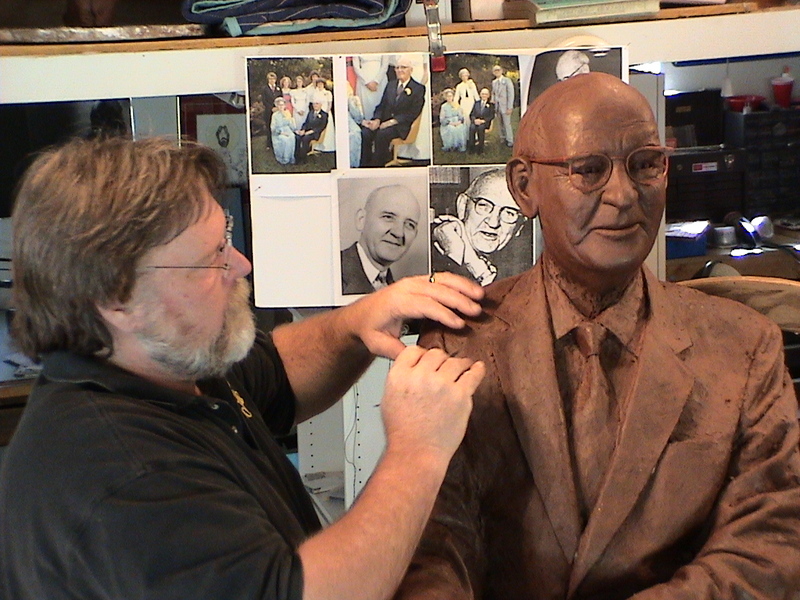 Through my career, so many have been fascinated by the process of creating sculpture. A visit to my studio always seemed to be fun for them. So, a portion of what I will be offering here is simply regular visits to my studio, my projects, and my process. 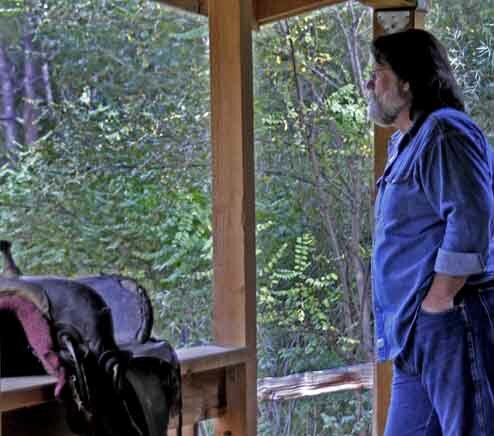 If you’d like to see what I’m up to, sign up for the email updates on this page and you’ll hear from me when I think there’s something going on that you might enjoy. My posts will be lots of pictures with brief comments. But, there will also be occasional observations about some things that are important to me. So, this is my conversation. I hope you’ll join in….. here we go! I am a professional sculptor. I love telling stories through bronze. This blog is my conversation about art, and faith, and life in the studio.